Launchpad, formerly apnscp, has officially launched. It’s built on PHP 7.1 (yay! ), Bootstrap 4 alpha6, jQuery 3, and given significant internal changes, its version number has been bumped to 3.0. It also drops support for IE9. The user interface has been redesigned to be cleaner, friendier on mobile devices, and customizable. 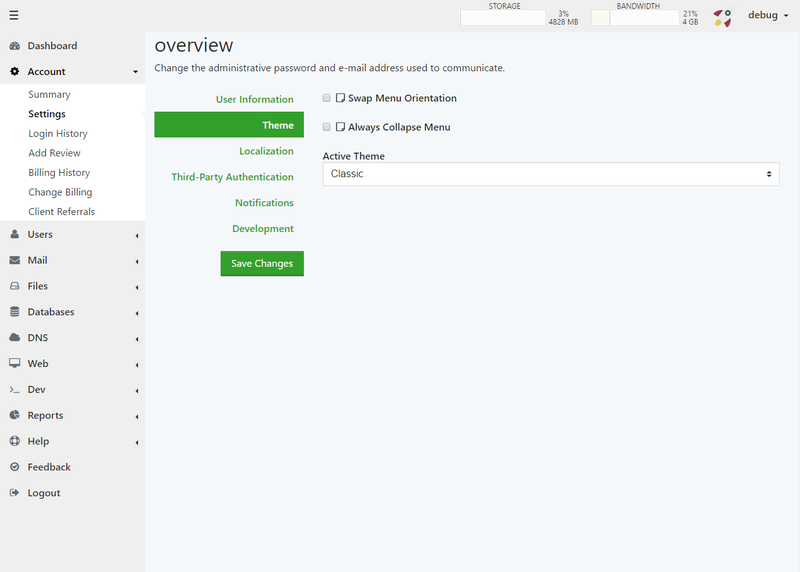 Two themes have been included, which can be selected via Account > Settings (formerly “Change Information”). A SDK will be published shortly allowing for user-defined themes. Secondary users now support email addresses via User > Manage Users. These can be used to alert the user of unauthorized logins on the account, password reset requests, or for two-factor authentication (coming soon!). All emails tie into Gravatar, so set one up if you have not yet. Gravatar is also integrated into WordPress, who also owns that service. In addition, 1-clicks now have a 2-click upgrade process to upgrade every 1-click application unassisted. Some of our clients managing 100+ WordPress sites have asked and we’re obliged to provide – plus the backend legwork to make this a reality was fun (see: app sideloading). 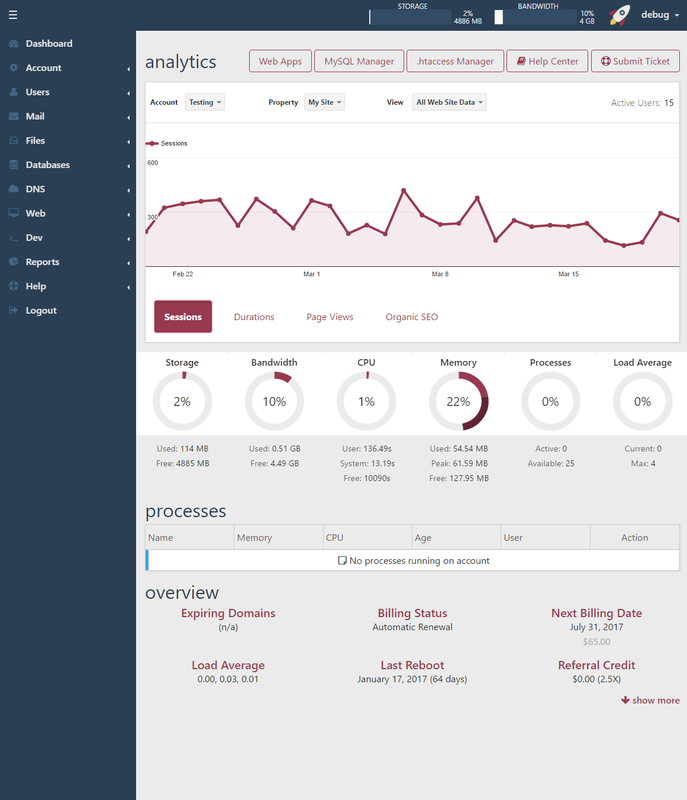 Visit Web > Web Apps to get started and if you are one of the 100+ WordPress site owners, you can grab a coffee. It’ll take a few minutes. App sideloads are now part of the panel. Any app can call another app’s controller or model to interact with it. This simplifies development upkeep on our end and enhances application scopes. Launchpad would not have happened and developed the way it has without client feedback. 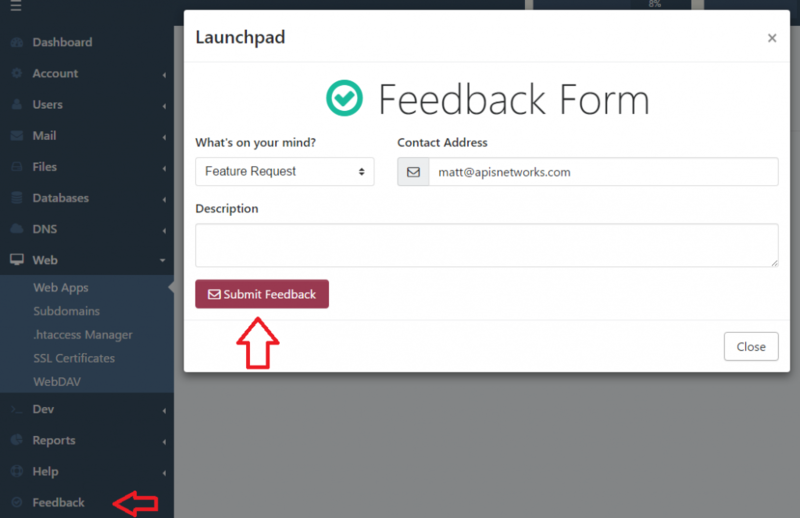 With Launchpad, it’s even easier to lend some inspiration using the Feedback tool available on every app. If you have an idea – no matter how dumb it may be (and there have been a few!) – send some feedback. Even if I can’t work with the idea directly, any insight can catalyze the next big thing. 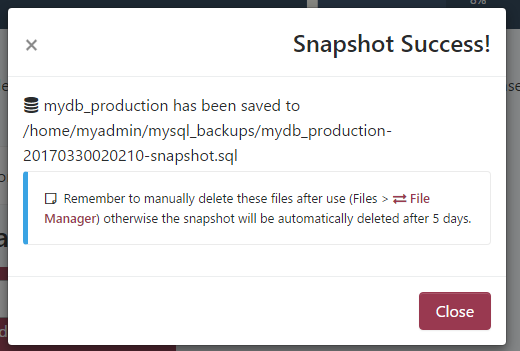 Snapshots are now available for PostgreSQL and MySQL. Select the Advanced menu () from the database listing to get started. Snapshots are written to disk without compression, but automatically delete after 5 days. From testing, snapshots are between 6x to 15x larger than compressed nightly backups depending upon algorithm (bzip is best). There are 2 ways to import a database into Launchpad, excluding phpMyAdmin which was the way to import traditionally. First, when creating a database, select the Advanced menu (). 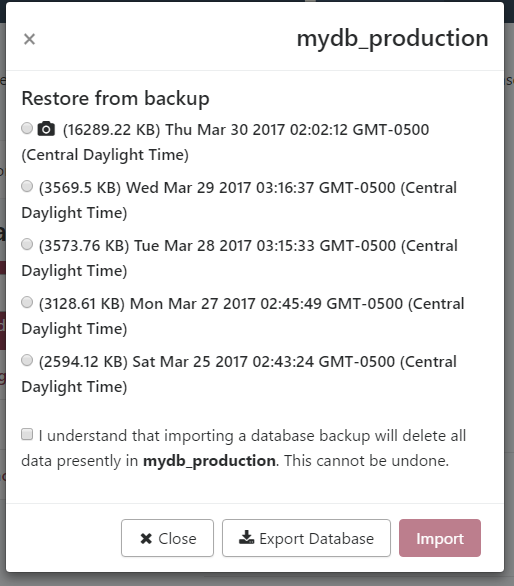 Second option, once a database has been created, is to manipulate snapshots by placing an uncompressed SQL backup named after the respective backup in your backup directory. Both work very well. Commit annotation naming conventions will change slightly. Lowercase annotations now reference modules or backend changes whereas Title Case refers to frontend applications or components (or sTuDLY CaSe with MySQL/PostgreSQL). There will continue to be some exceptions including “apnscp.js” that is frontend. If affected change annotated in lowercase, then assume it refers to a backend module. And one last thing. Check out Beacon! You can script with Launchpad from the shell, including some really cool, really easy multi-user ACL management.